Sometimes, life isn't easy. Sometimes God allows messy, difficult things to happen in our lives. Sometimes, we find ourselves caught in the middle of scary, chaotic, seemingly hopeless storms. God tells us this. We hear others talk about "storms", but sometimes it takes actually experiencing one to really understand. Just over a year ago, a tempest began in my life that I never saw coming. My life, and the life of my family was changed forever. I had been actively walking with Jesus for over ten years at this point. I knew the songs, the verses, the cheesy lines about hope, but I didn't fully grasp the magnitude of the word or how much I needed it in my life. Truth be told, my eyes weren't totally focused on Jesus. I had become pretty comfortable with my life. In March of 2014, the storm came out of nowhere and hit hard. Life as I had known it for 30 years, would never be the same. There were some serious accusations made against one member of my family by another member. My family was torn apart. I had always thought that through thick and thin, our family would stick together because that’s what families do and that’s what our family was supposed to do. In just a few short days, every member of my family’s world was rocked. We all began to grieve in different ways. The storm had left a wake of devastation, and turning to my family in this disarray was not the answer. I found myself in a place that seemed hopeless. The people that I cared about the most were hurting and there was nothing that I could to do to help them. I was hurting and couldn't turn to them because they were there too. There was much confusion. The only place that I could turn was to Jesus (and boy, am I glad He was there). I needed to fix my eyes on Jesus, not so that the problems would go away (they wouldn’t), but so that I knew there was hope in the storm surrounding me. I couldn’t help, but compare this to Matthew 25:21 when Jesus tells the parable of the talents. Those who invested wisely, who put their focus on the right things, heard “Well done, good and faithful servant.” In the Ironman, those who kept their eye on the finish line heard, “You are an ironman!’ It was a great reminder to keep my focus on the true finish line, on the hope that is to come, in Jesus. We have hope and it can be found in Christ alone. We need to keep our eyes focused on Him. I had learned this lesson. I should be good to go then, right? Wrong. Like I said, I’m a slow learner and God had more to do in my life. As I started to focus on Jesus more, I was becoming okay with the things happening in my family. It wasn’t that things were getting easier, in fact they only got messier and more turbulent as time went on. I was still praying (and am still praying) for reconciliation, but I knew that as long as I stayed focused on Him, though I may be caught in the middle of the storm, He would receive the glory for any good that comes out of it. And that one day, there will be no more tears. Like I mentioned, God wasn’t through teaching me to focus on Him and find my hope in Him. In August, I learned that our verse for the year at school (I teach preschool) would be Hebrews 12:1-2. Finally it settled in that God truly is my hope. That I need to look to Jesus in all that I do, that He is worthy of a life lived for him. Family life has not become any easier in the last several months. In fact, there are a few family events coming up in the coming months that involve some people seeing other family members for the first time in about a year, but life has become sweeter because I know that I am no longer looking to my family for hope, but to Jesus. 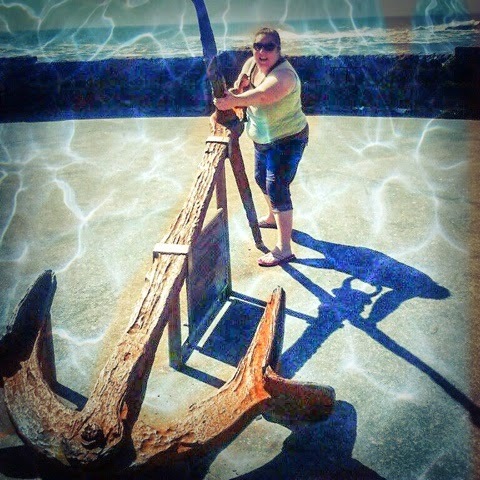 My soul is anchored in Christ. He is my hope. 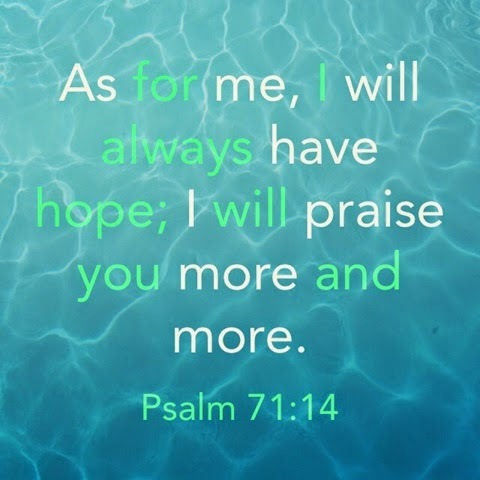 My life verse has long been Psalm 71:14, “As for me, I will always have hope; I will praise you more and more.” (NIV) Amidst the chaotic storm of life this last year, these words have never been truer. God is with me. I have hope that one day tears will be wiped away. One day, this world will be without sin, and one day, I will cross that finish line of life, and see Jesus face to face. To hear more from Karly find her at www.karlyisrandom.blogspot.com She writes blogs infrequently but deeply.